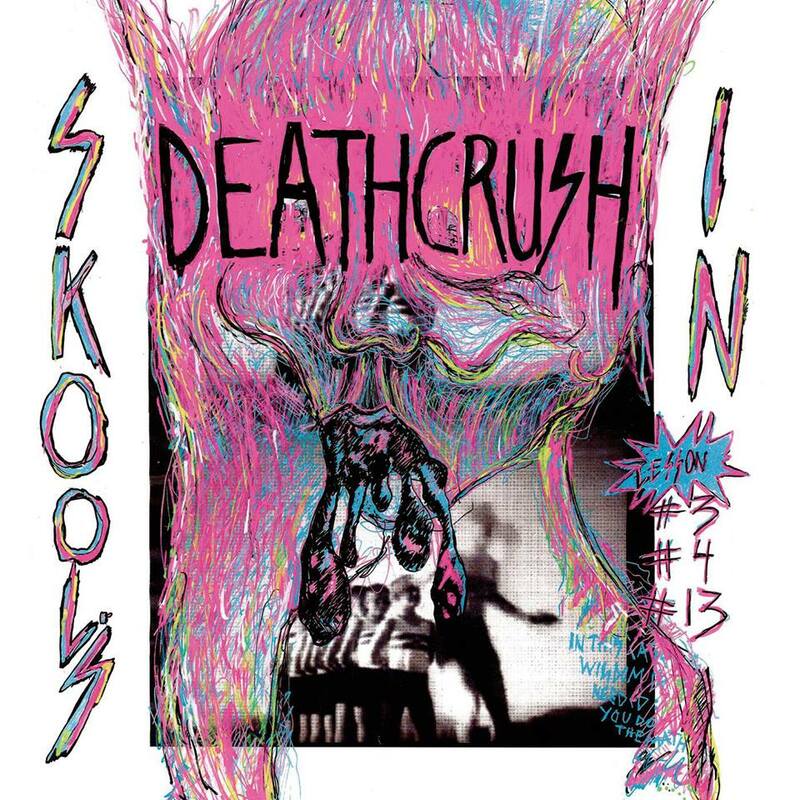 On the back of a limited Flexi Disc release accompanied by its very own magazine, Norwegian trio Deathcrush are readying their return with a brand new 4-track EP, entitled ‘Skool’s In’. Deathcrush, surely named after the debut album from notorious cult Norwegian black metal band Mayhem, are a Norwegian noise-pop act comprised of Linn Nystadnes on vocals/guitar, Åse Røyset on vocals/bass, and Vidar Evensen on vocals/drums. After recording tracks with metal legend Billy Anderson (Swans, Melvins, Sleep) and Jørgen Træen (Datarock, Annie) the new EP sees mixing duties handled by Deathcrush’s own Linn Nystadnes. The new four-track EP showcases the band’s ferocity and energy with “Lesson #3 for Gina Kikoine / You Now” leading the charge. An aggressive garage meets post-punk number, which features both the hooks and ferocity of Sleigh Bells meets Savages, Lesson #3 for Gina Kikoine / You Now” is characterized by its distorted bass, hard hitting drums, cascades of cymbals and punishing guitar, topped off by Linn Nystadnes’ distorted yet melodic vocals. Next up is “Wharton Tiers / Strauss”, which packs an even harder punch. Gone are the pop hooks and instead over the course of its five and half minutes, the listener’s ears are punished layers of feedback and drum fills. There are however brief moments of respite with the a couple of softened passages led by creepy, whispered vocals. Unsettling but brilliant stuff. In contrast, and despite its garage noise courtesy of detuned guitars and trash beats, “Lesson #13 for Nanker Phelge / Fire” is pure pop…but with a punk snarl. Yes, amidst all the noise, clocking in at just under 2 and half minutes, this is one catchy little song. Further emphasizing the song’s hooks are vocal melodies which interestingly exude a modern hip-hop flavour. The final track is a floor-filling remix of the aforementioned “Lesson #13 for Nanker Phelge / Fire” courtesy of Mau5trap label newcomer, James Njie. A thrilling, rage filled sugar-rush, ‘Skool’s In’ will be released digitally and on 12″ Maxi Vinyl on 7 October, 2013. In the meantime, Deathcrush are offering a free download of “Lesson #4 for Wharton Tiers / Strauss”, which you can download below.